I had never fixed cabbage rolls before, but for some reason I got it in my head that I wanted to. And you know what? They're kind of annoying to make. It takes much longer than I expected. The recipe I used, from a trusted source, was very bland. So I was disappointed in them overall. Lunch was roasted potatoes, carrots and onions, a strawberry, cabbage rolls, and a brownie with peanut butter chips for dessert. Pierce ate a few bites of cabbage roll, but it really wasn't his favorite thing either. Oh well, sometimes you venture out cooking something new and it flops. And then you learn! 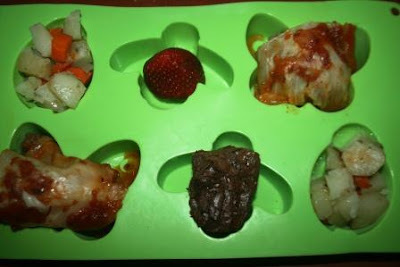 For more fun kid's lunch ideas, check out Muffin Tin Mom. It looks like everything else i the tin would go over big! I don't know, but I love cabbage, send them over to my lunch table. I bet I'll love them. Cabbage rolls sound good but I can imagine they would take some time to make. How disappointing that they were bland. Kudos to Pierce for taking a couple of bites! I've officially decided that I don't want to attempt cabbage rolls now. ;) Seriously, I've been wanting to try them for a while now...but,it's just one of those things that I keep putting off...I'm in no big hurry! Though, they give a Muffin Tin Monday a super mom kind of look, don't they? Ah, well. I guess know you know for next time. At least the other stuff was well liked. Hi There, I'm trying to begin catching up -after being gone for a week. I'd love the roasted potatoes, carrots and onions.... YUM! You never know until you try! Lots of other good things on the tray. You offer a good mix of nutritious foods. I guess I like bland food because I like cabbage rolls. Not everyone likes cabbage and it doesn't have much of a taste. I juiced cabbage last week and it was almost peppery tasting. You are lucky your kids would eat the cabbage rolls. I don't think my kids would touch them... they are so darned picky... ugh! Just last night at dinner I was telling Amy about some of my cooking flops-they happen to us all (and good some laughs like last night!) but it's discouraging when it's because of a bad recipe. I bet that brownie was good though! many, many of my new (and old) recipes flop -- ha : ) i love the motto 'live and learn'!!! is pierce okay with just one strawberry? I never tried them but it sounds like a great idea! Too bad as it is some trouble to make them. I make cabbage roll goulash and serve over rice or mashed potatoes. A lot less complicated. My mom used to make these all the time and I would peel the cabbage completely off and just eat the insides. Still do! So sorry the recipe was a bust. I hate when that happens. It's still a great looking lunch. I'm so glad I don't have to eat my lunch at work anymore. At least he tried it! This little pug loves cabbage! Yumm yumm! Looks like a yummy lunch! I love cabbage! I can't tell you how many flops I've made! It's so tasty and quick too. I've only had cabbage rolls a few times in my life and I did like them. I found a recipe that sounded easier to make the the traditional ones. If I find it in my stash of recipes I keep in my email drafts I'll forward it to you. I always love muffin tin Mondays! My cabbage rolls always end up soggy and borderline greasy. I finally quit making them too. I would like to make cabbage rolls -- someday -- but maybe just not the recipe you used! Lol. I love cabbage rolls but don't make them often due to the time involved. Wish there was a shortcut! We may have to look into that. At least you gave it a try. The brownie does sound yummy.